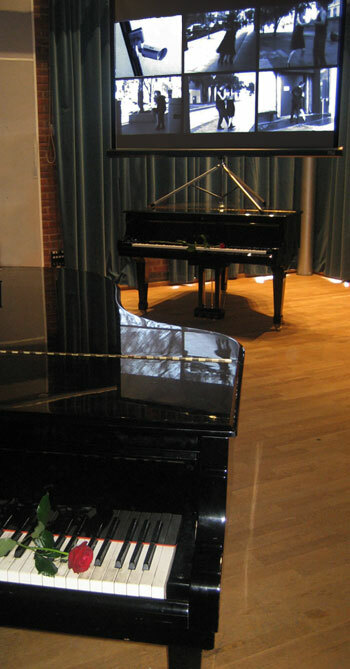 As part of the DRHA conference Sensual Technologies, Collaborative Practices of Interdisciplinarity Tango Panopticon was included as a site-specific video installation in the main recording studio at Brunel University, where I was able to incorporate two grand pianos into the installation. The piece was dedicated to the memory of pianist, composer, tango legend and political agitator, Osvaldo Pugliese. Pugliese's work as an orchestra leader was often interrupted by imprisonment due to his candid expression of his political views concerning oppressive Argentine regimes. During the frequent times that his orchestra had to perform without him the musicians would place a rose on the piano to signify his presence. Combining footage from recent Tango Panopticon actions in international cities into a projected grid reminiscent of surveillance control center monitors, Tango Panopticon (For Osvaldo) leverages another perspective on panoptic practice and questions the assumed one-way agency of public video surveillance.